SELL YOUR BOAT! BUY YOUR NEXT BOAT! We welcome advertisements for wooden boats, and resources that would be of interest to our members and readers. In the past this has included barometers, books, rope, engines, etc.. Advertisements run for two months, i.e. in 2 issues of our newsletter Shavings, and in the ‘For Sale or Wanted’ section of the WBA website. The text for your advertisement should generally be no longer than 100 words, and ads can also include photos or drawings. You can email your ad to editor@woodenboat.asn.au with the words “WBA advertisement” in the subject, or post it to WBA, P O Box 5237, South Melbourne VIC 3205. Non-WBA members are charged a flat $30 fee for inclusion in two issues of Shavings, and a two month placement on the WBA website. “Free to a good home” items attract no charge. If you are not a WBA member, you can pay by cheque made out to ‘Wooden Boat Association Inc.’ and posted with the ad, or by Electronic Funds Transfer to - Wooden Boat Association BSB 013 260 Account Number 303824509. Genuine set of plans for. 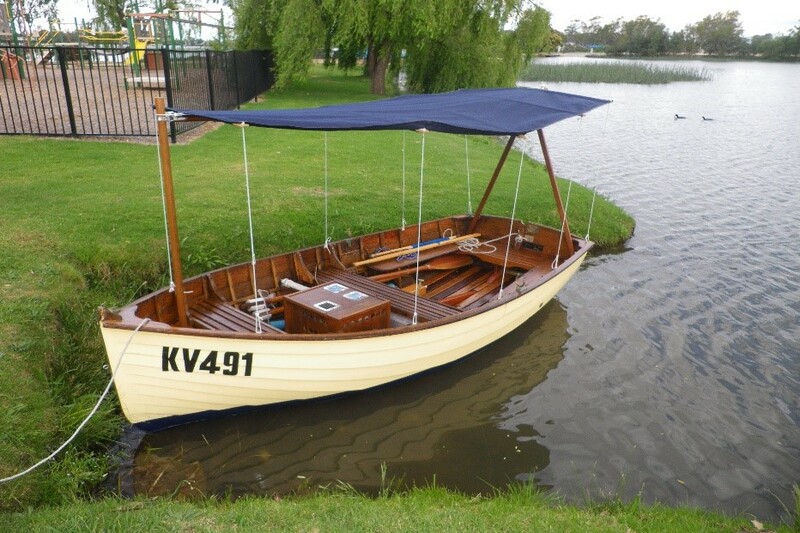 "WILLIAM ATKINS 1950 17ft Seabright Skiff." This boat dates from about 1950, is clinker construction using Kauri and Oregon. We restored it 2005, replacing a couple of planks, and rebuilding the interior. Interior is an oiled finish as per original. Now powered by a modern Honda GX160 air-cooled 4 stroke 5hp single cylinder engine adapted for use in the boat. It starts easily and is economical, easily does 4 hours running on the 5 litre tank, and has probably had no more than 50 hours use. Click here to download the "Advertising in Shavings" form. If you have a Sailfish tucked up under the house, or taking up space in the garage I am interested. I am looking for Sailfish to restore and get back on the water, so if you want space for the next project or just feel like it is time for your Sailfish to find a new home please contact me on either 0421 97 1366 or greg.barwick55@gmail.com to see if we can help each other out.